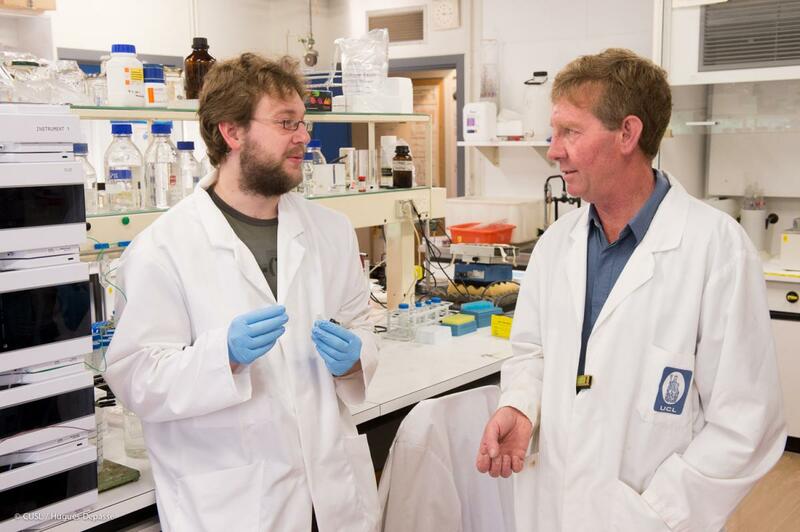 We study mechanisms controlling of cell function, particularly in relation to diseases involving metabolic disorders, such as type 2 diabetes and cancer. We also study metabolic adaptations in animals that can withstand stresses, including low temperature, anoxia and freezing, with medical implications for organ transplantation. Lastly, we run the core mass spectrometry facility on the Brussels campus of UCL devoted to protein analysis. Metformin is the most prescribed drug used worldwide for the treatment of type 2 diabetes, acting mainly on the liver to decrease glucose output. Metformin's action can partly be explained by activation of an enzyme, called a protein kinase, in this case the AMP-activated protein kinase (AMPK). AMPK catalyzes the phosphorylation of other proteins, notably key enzymes of metabolic pathways, switching them on or off. In general, AMPK activation in tissues and cells switches on energy-producing pathways, such as glycolysis and fatty acid oxidation, while at the same time switching off energy-consuming processes, such as protein synthesis. In this way, AMPK restores the energy balance of cells in response to ATP-depletion, such as occurs during anoxia or vigorous exercise in muscle. Thus, its main role is as a sensor of cellular and whole body energy homeostasis. 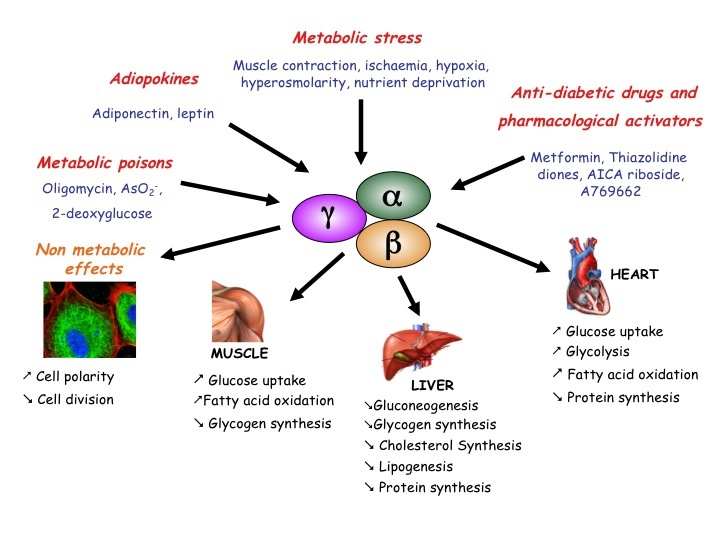 Interestingly, individuals taking metformin have a reduced incidence of certain cancers, and there is growing evidence that AMPK activation could correct metabolic dysfunction in disease states. Therefore, pharmaceutical firms are actively searching for new drugs that activate AMPK for the treatment of type 2 diabetes and cancer. We have made important contributions to the AMPK field by finding new targets in the control of glucose uptake, glycogen synthesis, glycolysis and protein synthesis. The search for AMPK targets is a main area of research, which we are pursuing using state-of-the-art mass spectrometry techniques. We are also testing new direct AMPK activators including natural plant-derived compounds, particularly in muscle, liver and adipose tissue, for their therapeutic potential in treating diabetes and cancer. AMPK is notably activated during muscle contraction and regular exercise is recommended to patients as a treatment for type 2 diabetes. Our group focuses on the control of cell function by reversible phosphorylation of proteins. Our main interests are the AMP-activated protein kinase (AMPK), insulin signalling via protein kinase B (PKB) and the role of fructose 2,6-bisphosphate (Fru-2,6-P2) in cell proliferation and cancer. We also investigate protein covalent modification and differential protein expression by electrospray ionization (ESI) mass spectrometry (MS) techniques. 1. AMPK: We are testing the effects of direct small-molecule AMPK activators and phytochemicals in muscle, liver and adipose tissue. We are also using direct AMPK activators in white adipose tissue to search for new targets and roles of AMPK. 2. Insulin signalling: We studied the role of protein kinase PKB in the stimulation of lipogenesis by insulin in white adipose tissue. 3. Role of Fru-2,6-P2 in the control of cell proliferation: We investigated the potential role of Fru-2,6-P2 in coupling glycolysis to cell proliferation in thymocytes stimulated by mitogens. 4. Mass spectrometry: We are developing mass spectrometry (MS)-based phosphoproteomics strategies. We routinely use MS for phosphorylation site identification and for the quantification of differential protein expression. AMPK is a serine/threonine protein kinase involved in the control of cellular energy homeostasis. It stimulates ATP-producing pathways and inhibits energy-consuming processes (Fig.1). We contributed to this field by finding new AMPK targets. We demonstrated that the activation by AMPK of PFK-2, the enzyme responsible for Fru-2,6-P2 synthesis, participates in the stimulation of heart glycolysis by ischaemia (Pasteur Effect). We also showed that AMPK activation inhibits protein synthesis in anoxic rat hepatocytes and in ischaemic rat hearts. Protein synthesis inhibition in response to AMPK activation can partly be explained by increased eEF2 (eukaryotic elongation factor-2) phosphorylation leading to its inactivation, but this is not a direct effect (see below). Regulation of the upstream eEF2 kinase (eEF2K) is complex involving phosphorylation-induced activation/inactivation by kinases from various signalling pathways. We found that eEF2K, as well as being a direct AMPK substrate, is also controlled by AMPK-induced inhibition of mammalian target of rapamycin (mTOR) with implications in the biology of cancer. Figure 1: Conditions leading to AMPK activation in higher eukaryotes and some of its consequences. We tested effects of direct AMPK activator compound 991 on hepatic glucagon signalling. Biguanides such as metformin had previously been shown to antagonize hepatic glucagon-stimulated cyclic AMP (cAMP) signalling­­­ independently of AMPK via direct inhibition of adenylate cyclase by AMP. We showed that incubation of hepatocytes with 991 decreased the glucagon-stimulated rise in cAMP, cyclic AMP-dependent protein kinase (PKA) activity and downstream PKA target phosphorylation. Moreover, incubation of hepatocytes with 991 increased the Vmax of cyclic nucleotide phosphodiesterase 4B (PDE4B) without affecting intracellular adenine nucleotide concentrations. The effects of 991 to decrease glucagon-stimulated cAMP concentrations and activate PDE4B were lost in hepatocytes deleted for both catalytic subunits of AMPK. Purified PDE4B was phosphorylated in vitro by AMPK at three sites, and by site-directed mutagenesis, Ser304 phosphorylation was shown to be important for activation. 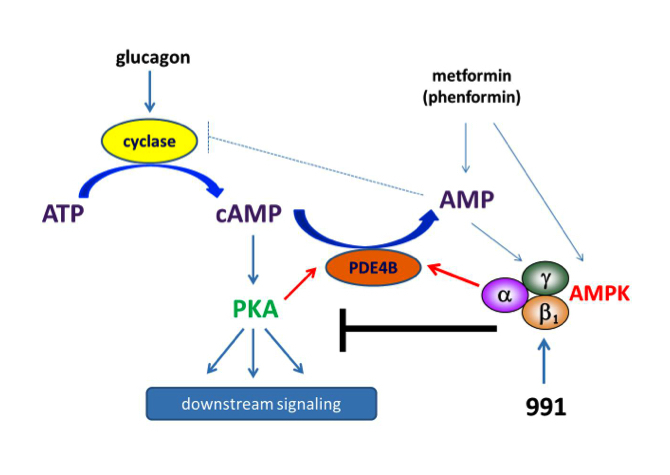 Our data suggest that AMPK activation in the liver could be beneficial by opposing short-term glucagon action via PDE activation to reduce cAMP as a new therapeutic strategy for the treatment of metabolic diseases associated with dysregulated cAMP/PKA signalling, such as type 2 diabetes (Fig.2). It is also noteworthy that cAMP signalling is important for the growth of certain cancers and that suppression of negative feedback mechanisms occurs during tumorigenesis. Figure 2: Schematic representation of the mechanisms by which biguanides and coumpound 991 antagonize glucagon signalling. Unlike biguanides, treatment with 991 activates AMPK without increasing cellular AMP levels. Both phenformin and 991 activate PDE in hepatocytes. Phosphorylation-induced activation of PDE4B by AMPK reduces glucagon-stimulated cAMP accumulation. As a consequence, PKA activation by glucagon and downstream signalling are decreased in hepatocytes incubated with 991, the effect being strictly AMPK-dependent. We clarified the mechanisms by which AMPK activation leads to increased eEF2 phosphorylation to decrease protein synthesis by showing that increased eEF2 phosphorylation in MEFs was mainly due to direct activation of eEF2K and partly due to inhibition of mTOR signalling. Treatment of MEFs with AMPK activators led to eEF2K activation independently of AMPK probably via a rise in intracellular Ca2+. 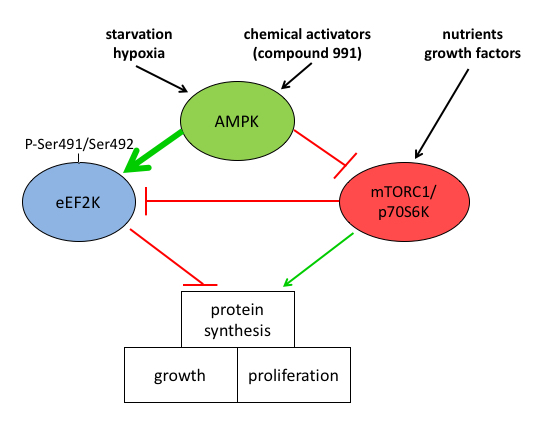 AMPK activated eEF2K by multi-site phosphorylation and newly identified Ser491/Ser492 was shown to be important for activation, leading to mTOR-independent inhibition of protein synthesis. Our study provides new insights into the control of eEF2K by AMPK, with implications for linking metabolic stress to decreased protein synthesis, a pathway that is of major importance in cancer cell survival (Fig.3). Figure 3: Mechanism of AMPK-induced inhibition of protein synthesis via eEF2K activation. AMPK activation inhibits protein synthesis needed for cell growth and proliferation. The mechanism involves both the indirect inhibition of mTOR and direct activation of eEF2K at the newly identified site(s) Ser491/Ser492. We collaborated with the pharmaceutical company AstraZeneca (Mölndal, Sweden) to investigate whether the inhibition of AMP-metabolizing enzymes could be a strategy to achieve AMPK activation for the treatment of type 2 diabetes. In rat skeletal muscle incubated with small-molecule AMP-competitive AMP deaminase (AMPD) inhibitors and in muscles from mice bearing a whole body deletion of AMPD1, AMPK activation by electrical stimulation was potentiated, as was with the rise in AMP. However, no potentiation of AMP levels nor AMPK activation was seen in contracting muscles from whole body soluble 5'-nucleotidase cN-IA (NT5C1A) and cN-II (NT5C2) knockout mice. Overall, our findings indicate that inhibition of AMPD1 and NT5C enzymes would not be a viable strategy for achieving AMPK activation for the treatment of metabolic disorders. For many years, we studied structure-function relationships and regulation by protein phosphorylation of the PFK-2/fructose-2,6-bisphosphatase (PFKFB) isoenzymes. We demonstrated the role of PKB in the mechanism by which insulin increases Fru-2,6-P2 content in heart via PFK-2 activation of the PFKFB2 isoenzyme. Using Akti-1/2 and MK-2206 PKB inhibitors, we also showed that PKB played an important role in the insulin-induced stimulation of glucose transport, glycogen synthesis and protein synthesis in incubated rat epitrochlearis muscle. In rat epididymal adipocytes, we studied the role of PKB in the stimulation of lipogenesis by insulin using Akti-1/2 and the MK-2206 inhibitor. Although incubation with the inhibitors blocked insulin-stimulated lipogenesis, the changes in phosphorylation states of some of the key enzymes were unaffected. Therefore, athough PKB activation is important, other pathways are involved in insulin-stimulated lipogenesis in white adipose tissue. Proliferating cells depend on glycolysis mainly to supply precursors for macromolecular synthesis. Mitogen stimulation of rat thymocytes with concanavalin A (ConA) led to time-dependent increases in lactate accumulation, Fru-2,6-P2 content, PFKFB3 and PFKFB4 protein levels and rates of cell proliferation and protein synthesis compared with resting cells. Although PFKFB3 could be phosphorylated at Ser461 by PKB in vitro leading to PFK-2 activation, PFKFB3 Ser461 phosphorylation was barely detectable in resting cells and only increased slightly in ConA-stimulated cells. On the other hand, PFKFB3 and PFKFB4 mRNA levels were decreased substantially by exposure of ConA-stimulated cells to low doses of MK-2206, suggesting control of expression of the two PFKFB isoenzymes by PKB. Treatment of ConA-stimulated thymocytes with PFK-2 inhibitor (3PO) or MK-2206 led to significant decreases in Fru-2,6-P2 content, medium lactate accumulation and rates of cell proliferation and protein synthesis. These data were confirmed by using siRNA knockdown of PFKFB3, PFKFB4 and PKB α/β in the more easily transfectable Jurkat E6-1 cell line. The findings suggest that increased PFKFB3 and PFKFB4 expression, but not increased PFKFB3 Ser461 phosphorylation, plays a role in increasing glycolysis in mitogen-stimulated thymocytes and implicate PKB in the upregulation of PFKFB3 and PFKFB4. The results support a role for Fru-2,6-P2 in coupling glycolysis to cell proliferation and protein synthesis in this model. The development of mass spectrometry (MS) facilities within our laboratory, and for our Institute and University, has been an asset. Since the acquisition of an electrospray mass spectrometer in 1997, the application of mass spectrometry techniques has led to nearly 100 publications. In our own research, it enabled us to identify new phosphorylation sites in the AMPK complex and to demonstrate that in heart, insulin antagonized AMPK activation during ischaemia via PKB-induced phosphorylation of the AMPK catalytic α-subunits at Ser495/491. Our Institute has recently acquired the advanced high-resolution Orbitrap Fusion Lumos mass spectrometer from Thermo Scientific that will allow post-translational modification analysis and absolute quantification using isobaric tags. We study differential protein expression by label-free multidimensional LC-MS. One application is the identification of physiological substrates of MsrP, a newly discovered methionine sulfoxide reductase. Twenty proteins that had one or more HOCl-oxidized Met residues that MsrP could reduce were identified, establishing that MsrP is able to repair a wide panel of structurally and functionally diverse periplasmic proteins. We use phosphoproteomics to identify new targets downstream of signalling pathways. We developed a strategy of SDS protein extraction/trypsin digestion combined with strong cation exchange and hydrophilic interaction liquid chromatography (HILIC) followed by metal oxide affinity chromatography (MoAC) to enrich and concentrate phosphopeptides. The methodology was used to investigate changes in Brown adipose tissue (BAT) from thirteen-lined ground squirrels (Ictidomys tridecemlineatus), comparing euthermic squirrels with squirrels in deep torpor. Amongst the targets identified, pyruvate dehydrogenase (PDH) phosphorylation increased during ground squirrel hibernation, and this was confirmed by immunoblotting with phospho-specific antibodies. PDH phosphorylation leads to its inactivation, which suggests that BAT carbohydrate oxidation is inhibited during hibernation. Phosphorylation of hormone-sensitive lipase (HSL) also increased during hibernation, suggesting that HSL would be in a partly activated state in BAT to produce the fatty acids that are likely the primary fuel for thermogenesis during arousal. Post-doc, Ph.D. and undergraduate students are welcome to contact Mark Rider about training and fellowship application opportunities. Note that some post-doctoral fellowships are available from the de Duve Institute post-doctoral program. Changes in the phosphoproteome of brown adipose tissue during hibernation in the ground squirrel, Ictidomys tridecemlineatus. Herinckx G, Hussain N, Opperdoes FR, Storey KB, Rider MH, Vertommen D.
Direct and indirect activation of eukaryotic elongation factor 2 kinase by AMP-activated protein kinase. Johanns M, Pyr Dit Ruys S, Houddane A, Vertommen D, Herinckx G, Hue L, Proud CG, Rider MH. Effects of genetic deletion of soluble 5'-nucleotidases NT5C1A and NT5C2 on AMPK activation and nucleotide levels in contracting mouse skeletal muscles. Kviklyte S, Vertommen D, Yerna X, Andersén H, Xu X, Gailly P, Bohlooly-Y M, Oscarsson J, Rider MH. Am J Physiol Endocrinol Metab. 2017;313(1):E48-E62. Role of Akt/PKB and PFKFB isoenzymes in the control of glycolysis, cell proliferation and protein synthesis in mitogen-stimulated thymocytes. Houddane A, Bultot L, Novellasdemunt L, Johanns M, Gueuning MA, Vertommen D, Coulie PG, Bartrons R, Hue L, Rider MH. AMPK antagonizes hepatic glucagon-stimulated cyclic AMP signalling via phosphorylation-induced activation of cyclic nucleotide phosphodiesterase 4B. Johanns M, Lai YC, Hsu MF, Jacobs R, Vertommen D, Van Sande J, Dumont JE, Woods A, Carling D, Hue L, Viollet B, Foretz M, Rider MH. Insulin antagonizes ischemia-induced Thr172 phosphorylation of AMP-activated protein kinase alpha-subunits in heart via hierarchical phosphorylation of Ser485/491. Horman S, Vertommen D, Heath R, Neumann D, Mouton V, Woods A, Schlattner U, Wallimann T, Carling D, Hue L, Rider MH. J Biol Chem. 2006; 281(9):5335-40. 6-phosphofructo-2-kinase/fructose-2,6-bisphosphatase: head-to-head with a bifunctional enzyme that controls glycolysis. Rider MH, Bertrand L, Vertommen D, Michels PA, Rousseau GG, Hue L.
Biochem J. 2004; 381(Pt 3):561-79. Review. Activation of AMP-activated protein kinase leads to the phosphorylation of elongation factor 2 and an inhibition of protein synthesis. Horman S, Browne G, Krause U, Patel J, Vertommen D, Bertrand L, Lavoinne A, Hue L, Proud C, Rider M.